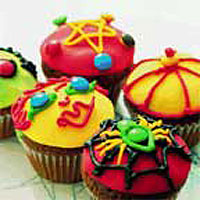 Novelty cakes are always popular with children and these spooky brownies will prove a hit for Halloween. Using chocolate beans and ready-made icing from the Supercook range of baking and decorating accessories, they couldn't be easier to make. Preheat the oven to 180°C, gas mark 4. Break the plain chocolate into a pan and add the butter. Heat gently, stirring occasionally, until melted and combined. Set aside to cool slightly. In a large bowl, whisk the eggs and sugar until frothy, then whisk in the chocolate mixture, followed by the flour and chocolate beans. Line four 12-hole, non-stick mini muffin tins with paper cases and spoon the mixture in. Place the tins on baking sheets and bake for 15 minutes until risen and firm to the touch. Leave to cool for a minute or two in the tin, then turn out onto a wire rack to cool completely. Dust a work surface with icing sugar. Roll the icing into small balls then flatten onto the work surface. Brush the tops of the brownies with a little honey then stick on the icing to give an even covering. Leave the icing to set for a couple of minutes. Using the icing pens and chocolate beans, decorate the tops of the brownies. See over for a few ideas. The brownies can be cooked in batches if you don't have 4 mini muffin tins. If you want to make larger cakes, use two 12-hole tartlet tins lined with paper cases.